A stylish beverage container that is used for holding both hot and cold liquids. Typically made from materials such as glass, metal or plastic formed into an appealing shape, a Carafe will often hold water, wine, punch, a carbonated beverage, tea, coffee, cocoa, and other similar drinks. While many Carafes will be simple in design with a stylized neck, some are very decorative and are designed with flowing lines that are often considered beneficial for the purposes of pouring or decanting beverages, such as wine. Some Carafes are manufactured to keep liquids hot or cold so they are built containing an insulated shell made with reflective glass or metal as the interior material and a molded insulation as the outer coating. 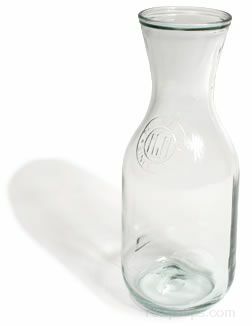 This type of Carafe will have an attached or removable lid that keeps the hot or cool temperatures retained as much as possible within the beverage.